Immediately restore skin’s radiance with the Vichy Double Glow Peel Mask, a glow-enhancing mask for dull complexions. Formulated to boost your skin’s natural radiance, the Vichy Double Glow Peel Mask instantly restores luminosity back into your complexion. One part of the double-peel action consists of chemical AHAs made from fruit acids, which sweep away dead skin cells to reveal a fresher, more even texture to the skin. Secondly, a physical exfoliator made with a volcanic rock origin buffs and brightens your skin tone. Enriched with Vichy Thermal Spring water to soothe and hydrate your complexion, your skin looks and feels visibly radiant with every use. Use 1 – 2 times a week. Apply all over in circular motion, leave for 5-10 minutes then rinse. Hypoallergenic. Paraben-free. Non comedogenic. Suitable for sensitive skin. 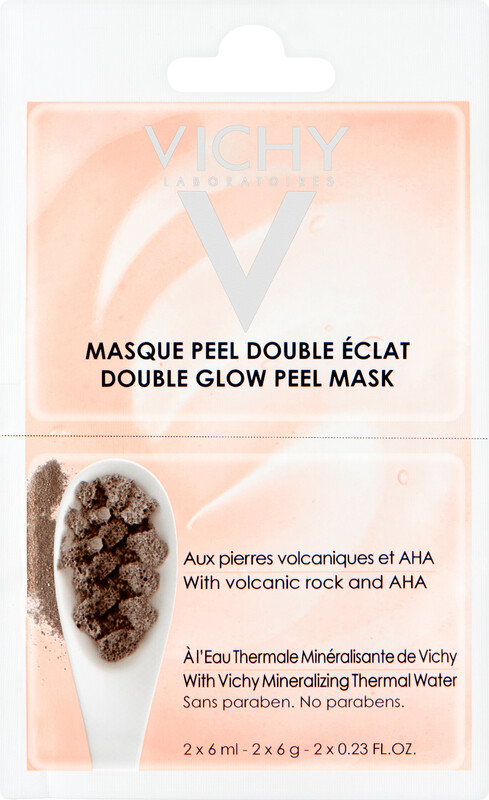 Vichy Double Glow Peel Mask is rated 4.3 out of 5 by 4. Rated 4 out of 5 by Ronika from Good Very refreshing while using and the effects lasted a good few days. I've been using this once a week and haven't noticed any side-effects. Rated 4 out of 5 by Irenec from For the over 70s The product was recommended in the Daily Mail for my age group. I have only just started using it but find it easy to use and it is low fragrance which I prefer. I don't expect miracles but it does feel nice on the skin and after rinsing off. I feel I shall continue using it and re-purchase when I have finished this jar. Rated 5 out of 5 by Arina7 from Good Purchase This is an effective but gentle peel. Skin feels softer and looks glowing. I haven't used it long enough to see what the long term effects are. But I'm pleased so far. Rated 4 out of 5 by Sibyl from skin felt so soft It makes my skin so soft but it stings my skin the first 2 mins. As I have sensitive skin, I only left it for 4-5 mins but I can tell the difference already. I taken one star off just because of the jar although I love the design, I just feel that it's not very hygienic.